Let me just start by saying this cake is deadly. I have yet to tally up the exact calorie count, but my current estimate is about 10,000. Per bite. And it’s also super delicious. Bad combination, indeed! I decided to surprise my mom this Christmas by baking a štedrovečerný koláč (Christmas Eve cake), or štedrák for short. This cake (koláč) is baked for Christmas or New Years, but never in my family. This was the first time for both my mom and me to try this treat. We’ve been missing out! Štedrák is a layered cake. The layers are made of leavened dough, and are filled with the traditional Slovak village home-cooking fillings: plum jam, poppy seeds, ground walnuts, and farmer cheese. Think of it as buchty, poppy seed rolls, and tvarožník all fused into one delicious calorie bomb. 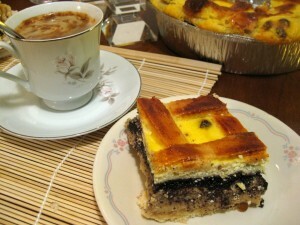 I found the recipe for the cake in Slovenská Kuchárka (available online here). 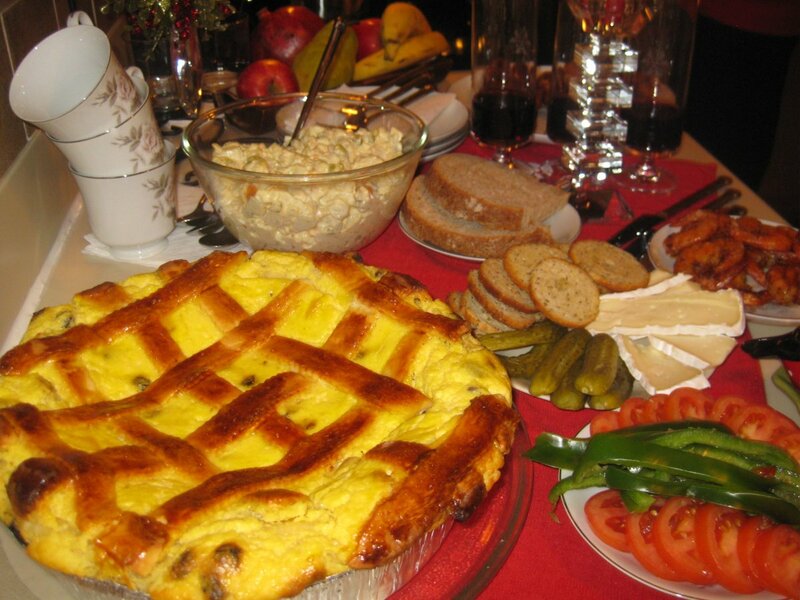 I also found several recipes online on mimibazar, toprecepty.cz, and mojerecepty). The last one, from mojerecepty, is interesting, because instead of being layered, the fillings are organized as concentric circles. This cake originated as traditional ceremonial holiday bread, similar to the Eastern Slovak kračún, which was believed to hold magical powers. This bread was prepared for the Christmas Eve dinner, and the many layers symbolized abundance, fertility, and good harvest. This is because the belief of first-day magic was prevalent in the olden days. Back when Christmas coincided with New Years, and as one did on Christmas, one was bound to repeat during the whole next year. There are also different versions of this cake, some containing ingredients such as hazelnuts, prunes, or apples. These days, it is prepared only rarely. Instead, it’s place at the Christmas table has been taken over by the poppy seed (makovník) or nut rolls (orechovník), or various assorted Christmas cookies (this info comes from Úľuv, Slovak Centre for Folk Art Production). Anyway, enough blabbering, let’s start baking! 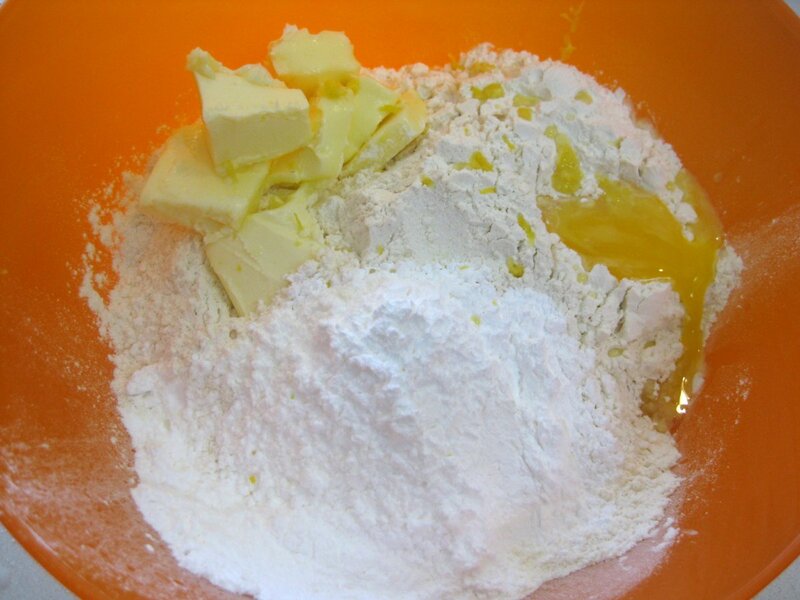 The recipe below is how I made it. It’s a variation on the recipes above. Feel free to experiment, especially when it comes to the fillings. 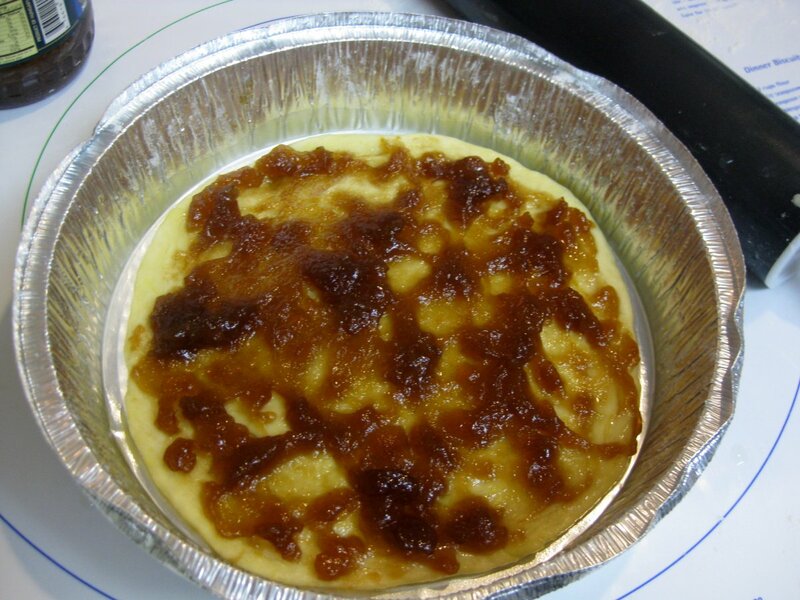 Farmer cheese filling: 300g farmers cheese, 4 tbsp sugar, 4 tbsp butter, 3 tbsp raisins, 2 yolks, snow from two whites, vanilla sugar, lemon zest. 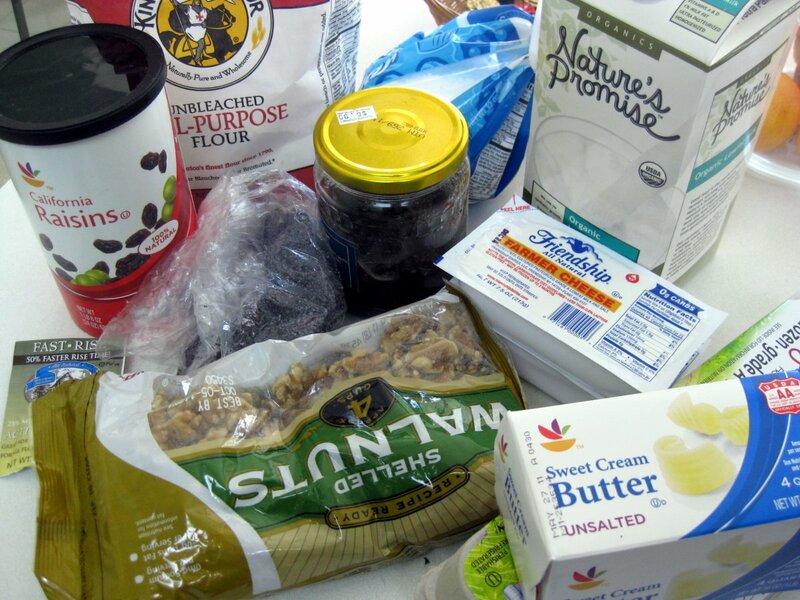 Here are the ingredients you’ll need. If you are having hard time finding poppy seeds, try asking the bakery department in your local grocery store. I was able to buy a pound of poppy seeds for a mere dollar at my local Giant! The plum jam came from Russian gourmet store. 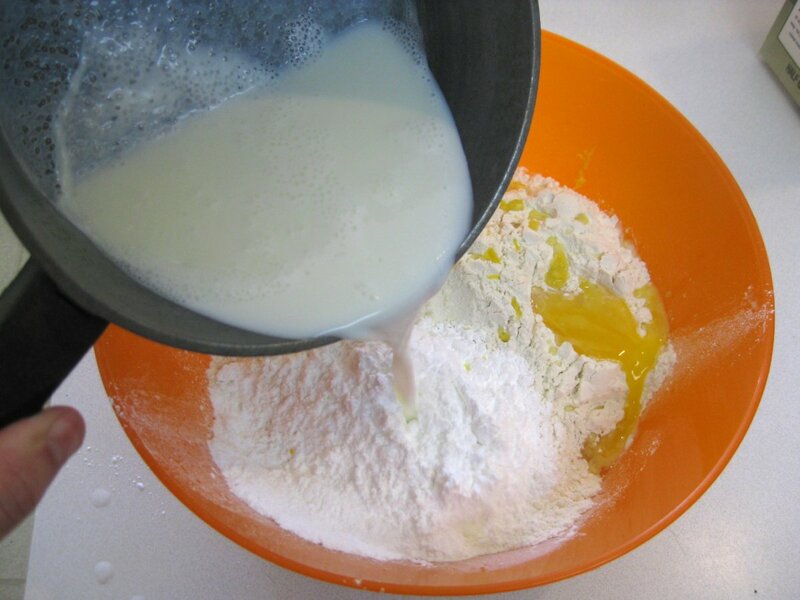 Combine the ingredients, minus the yeast and milk, in a bowl. I decided to scald the milk. Scalding milk used to be required back in the days before all milk got pasteurized. Nowadays, it’s no longer needed for safety reasons – and there is an interesting debate on About.com on this topic. The recipes did not call to scald the milk, but I figured it will improve the taste. The warm milk will also heat up the dough, aiding the fermentation. 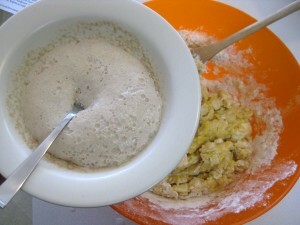 Mix everything together, and only then add the primed yeast. Yeast likes it warm, but not hot. By adding the yeast to the hot milk directly your run the risk of cooking the yeast, which would be bad. To prime the yeast, simply pour little bit of milk into a bowl, microwave for 10 seconds, add a spoon of sugar and the yeast, and then whisk for 20 seconds with a fork to give the yeast air. Let sit for few minutes until it bubbles up. 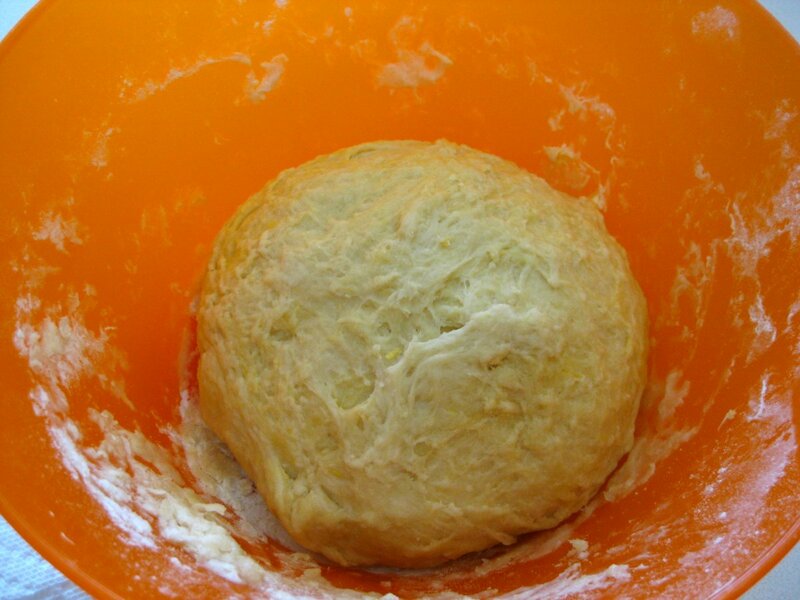 Knead together until you get smooth dough that doesn’t stick. 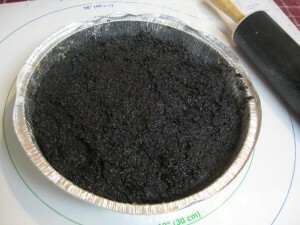 Form into a ball, cover with a cloth, and let rise for 3 hours. You can also do what I do, and that is after two hours deflate the risen yeast, knead for about 5 minutes, and let rise again. Alright, that’s done. Now let’s start preparing the fillings! You will need a poppy seed grinder to make the poppy seed filling. Coffee grinders don’t work too well. The blades simply slice the seeds, but you actually want to break them by squishing them. 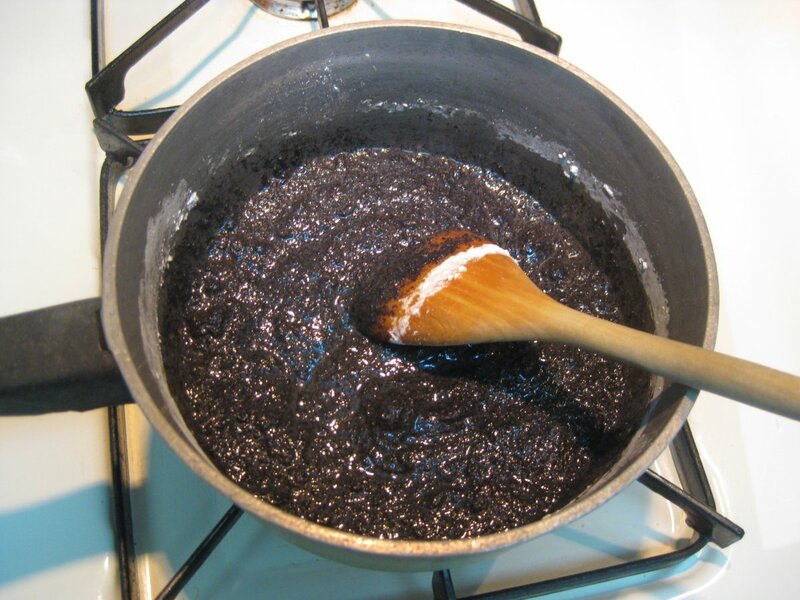 This releases the oil stored in the seeds resulting in a smooth paste. 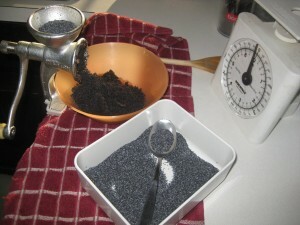 Poppy seeds ground in a coffee grinder end up looking like dust. 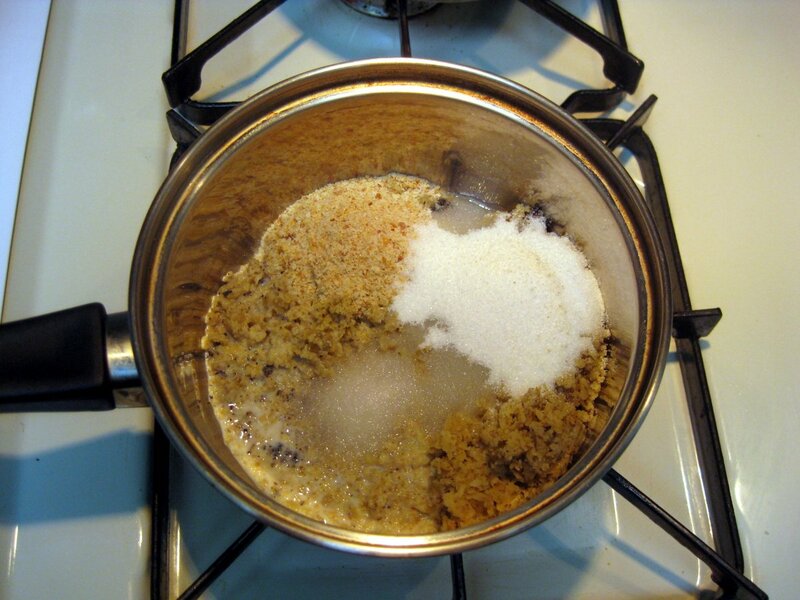 Combine the seeds, butter, and sugar in a pot and heat on low heat. Bring to boil, stirring continuously. This will take about 15 minutes. 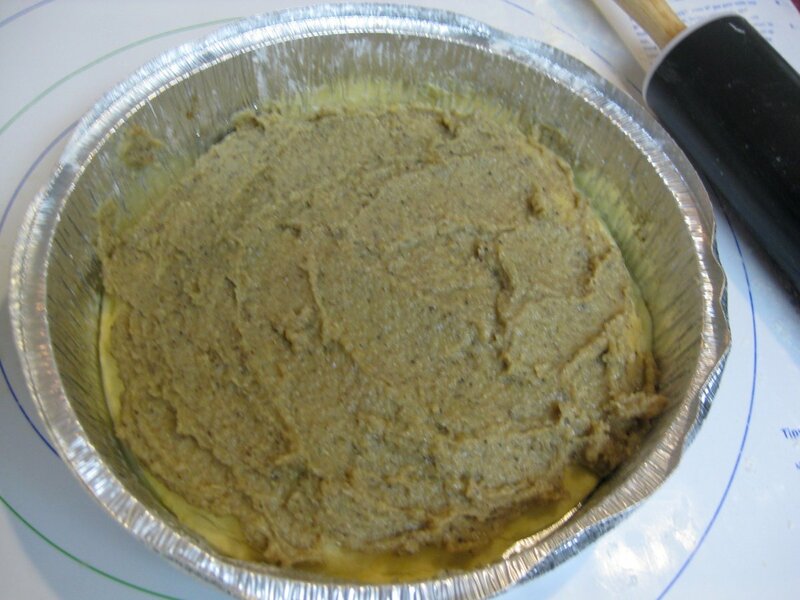 The walnut filling is made similarly, but you use ground walnuts. I ground the nuts by first chopping them in a food processor to get small chunks. I then ran them through the same grinder used to grind the poppy seeds. 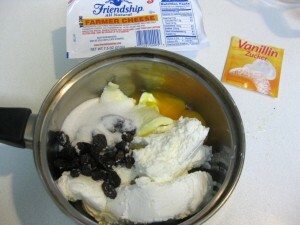 To make the farmer cheese (tvaroh) filling, combine farmer cheese, two yolks, sugar, raisins, lemon zest, and vanilla sugar. 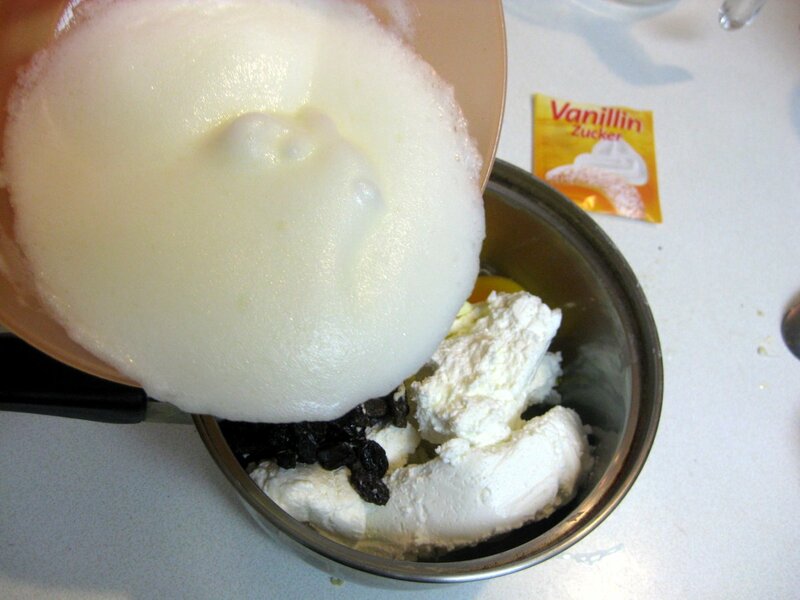 Save the egg whites and beat them for about 10 minutes until you get foam, called snow (sneh) in Slovak. It shouldn’t be as stiff as when making meringue, whisk it until it resembles whipped cream. You don’t cook this filling. Just mix it together until everything is blended. The cookbook said to mix the plum jam with lemon zest. It actually said to add lemon zest to all the fillings. I only added it to the farmer cheese, and used plum jam straight out of the jar. The layers are now done. Let’s assemble it all together. After the dough has risen, form it into a brick, and divide into five equal chunks. 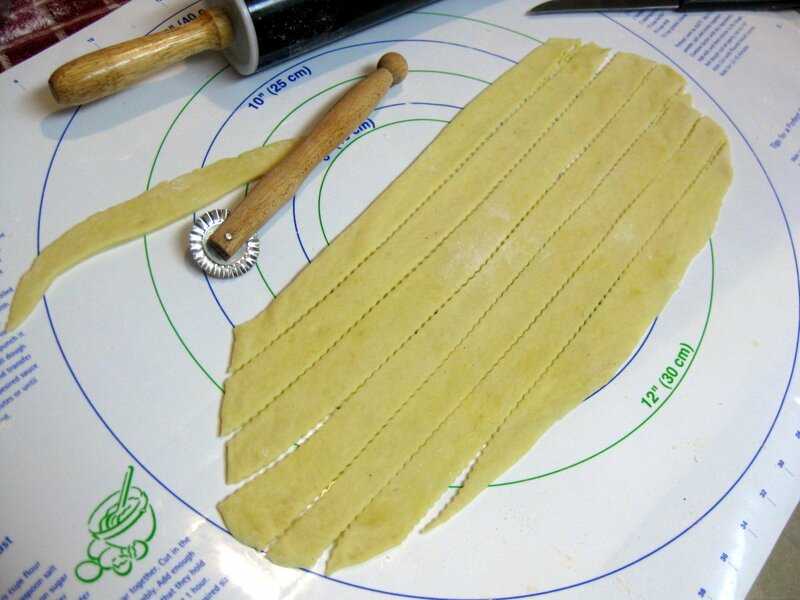 The recipe book said to roll out each section to the thickness of a finger (about 1cm). 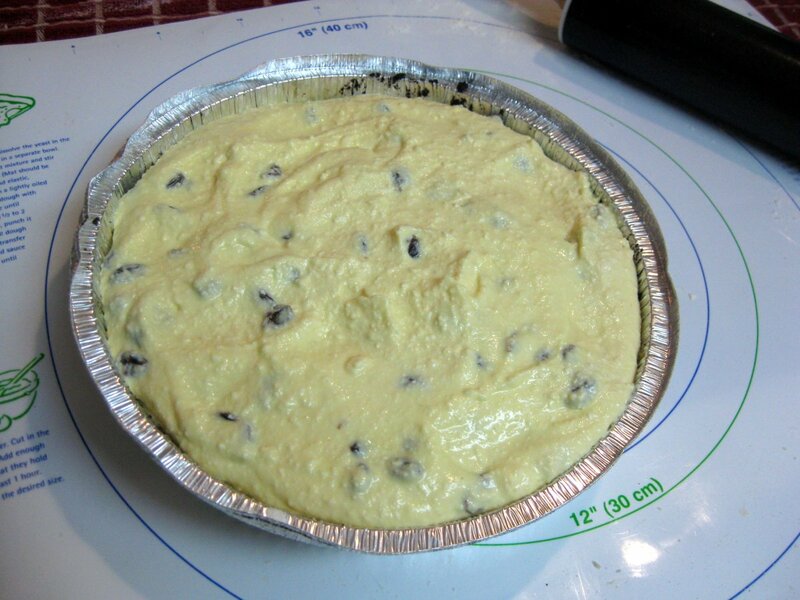 I had WAAY too little dough and WAAY too much filling for this – the cake would be as big as an index card, and tall as a small child if I did it like that. 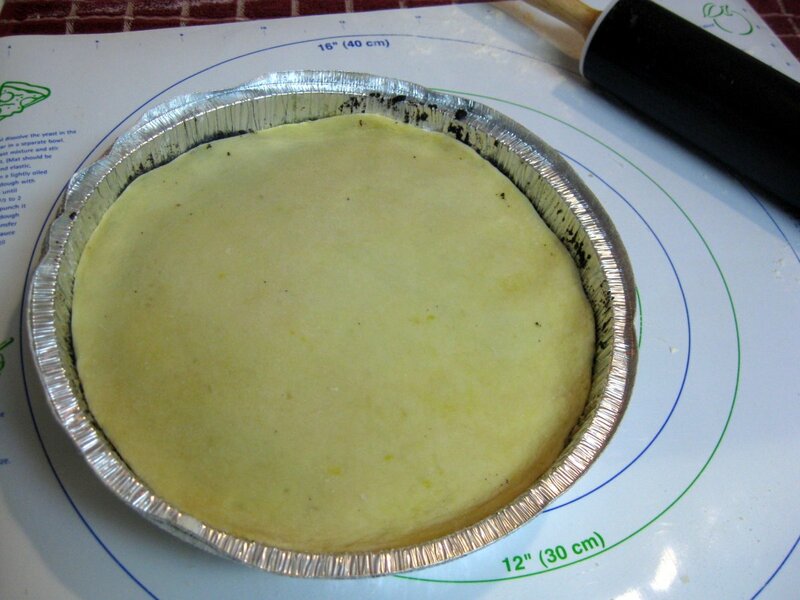 This cake is usually made in a rectangular shape, but I happened to have this convenient aluminum pie pan lying around. 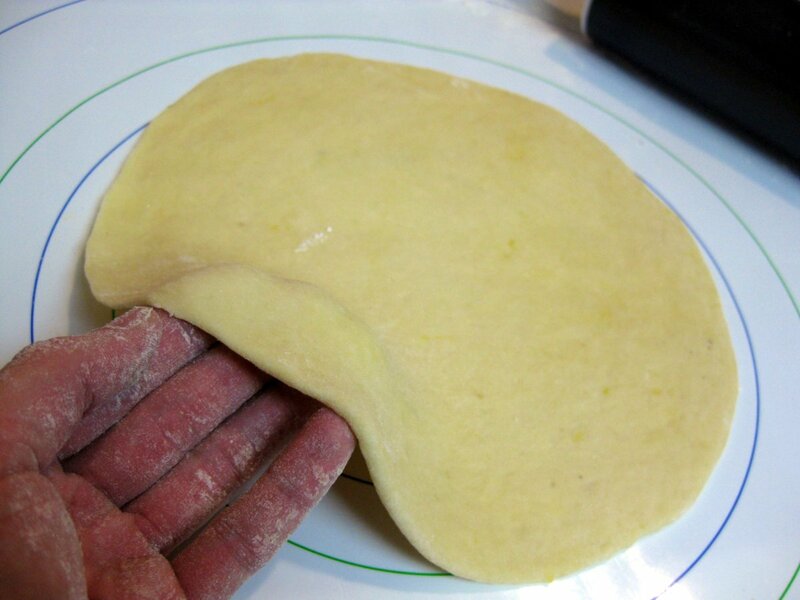 So I rolled the dough out to the size of the pan. It ended up being about 3 mm thick. 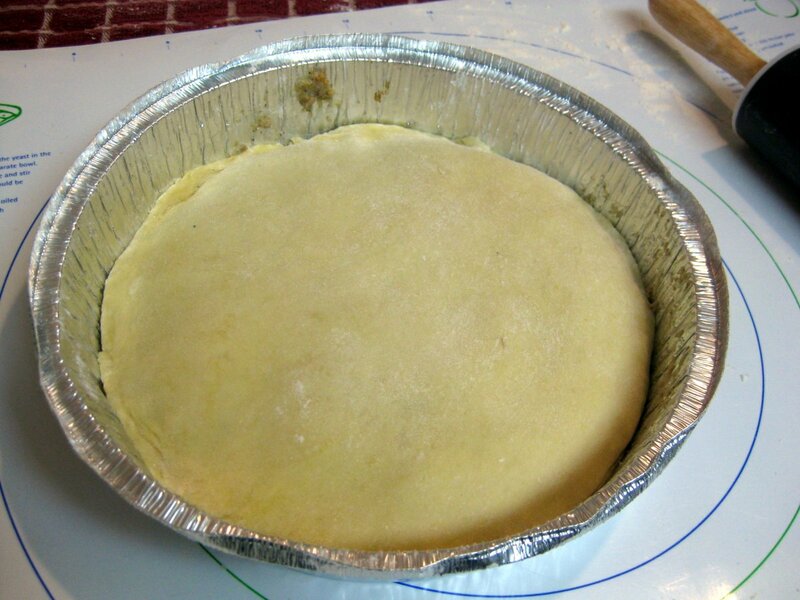 Place one layer on your baking sheet or in the pan (make sure to grease it first). Then spread plum jam on it. 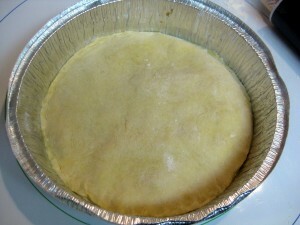 Top with another layer of dough. I rolled the first layer bit too small so I made the second one slightly larger bigger than the pan and pushed the extra dough down to seal the jam in. 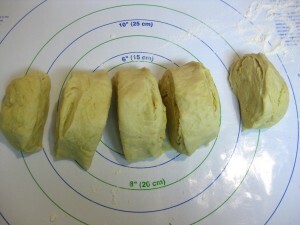 Gently flatten the dough with your palm, and spread the walnut filling on it. Then top with another layer of dough. Cover this layer with the poppy seed paste, and top again with another layer of dough. And then cover this one with the farmer cheese filling. Now, take the last piece of dough, and roll it out into a long rectangle (instead of a circle). Cut into stripes and arrange these in a grid on the top. This was my first time making such a grid – I definitely need more practice! Try to arrange the strips so they alternate up-and-down to get a nice cross-stitch pattern. 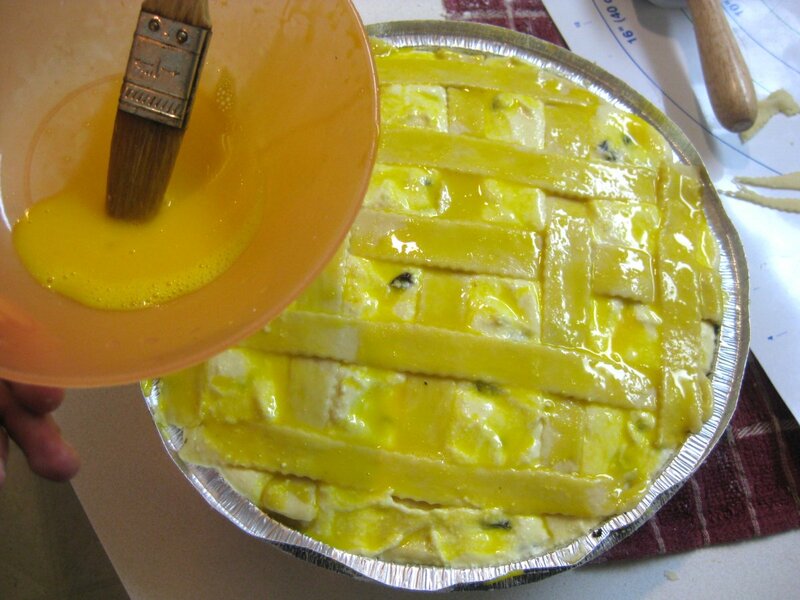 Then beat one yolk and coat the top of the cake with this egg wash. Bake in an oven preheated to 350F for 40 minutes until the top gets nicely brown. 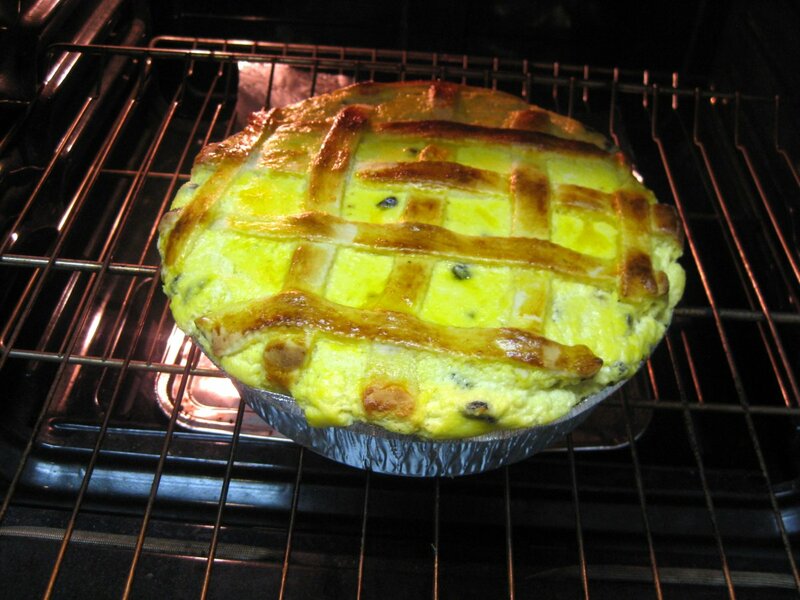 Let cool, slice into small squares (the cake is really rich and filling), and enjoy. A lot of work, but definitely worth it! Check out my little write up to find out more about Christmas in Slovakia. And also check out the other Christmas recipes. My hat’s off to you for taking on this project, Lubos~. It looks delicious. A minor correction: “…similar to the Eastern Slovak _kračún_…”. The name of the bread is _kračunik_ (I have one sitting in my kitchen). _Kračun_ is our word for Christmas. Thank you Helen! But kračún is also name of the bread, see http://www.jankohrasko.sk/clanky/clanky/2008/december/stedry-den-alebo-kracun-vilija for instance. Good job! I liked it. Now running to the gym. Thank you Sandrita 🙂 No worries, you’ll burn it all off in that hot Colombian sun in few days. Omg, I so have to make this! 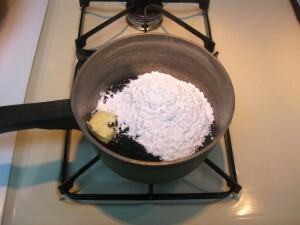 I have always made my poppy seed filling with granulated sugar but I see in the picture that you used powdered sugar. Do you think it matters? Do you think this could be made in a spring form pan for better presentation?